What quite literally starts as four posts, four beams and a roof is quickly transformed into a cozy custom cabin by the Backcountry Hut Company. 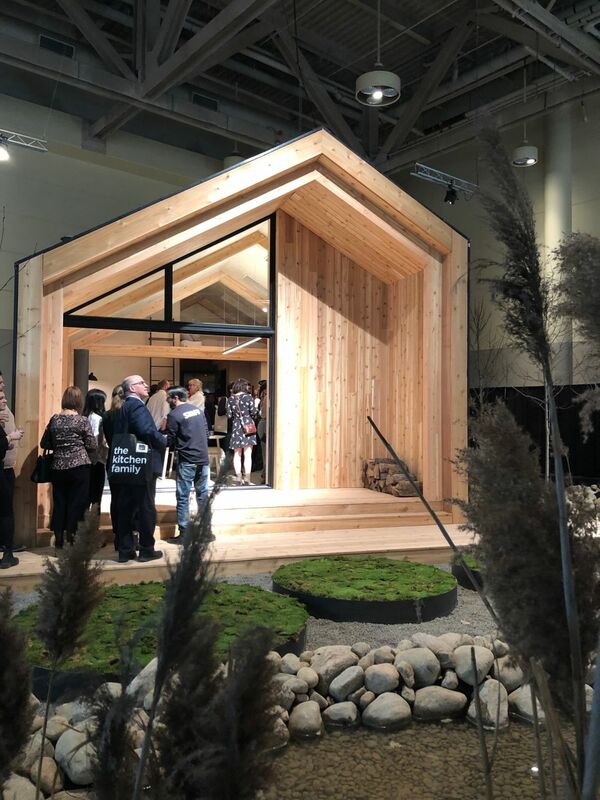 Visitors to the IDS in Toronto got a chance to see such a cabin as the 2019 design concept house was the Great Lakes Cabin. With today’s growing interest in pre-fabricated structures, especially for nature getaway properties, the cabin was a big draw. Large windows are key to enjoying nature. Billed as a “kit-of-parts” concept for creating small-scale structures, the Company’s modular cabins are delivered in a flat pack that can be delivered to location or flown into a remote area. 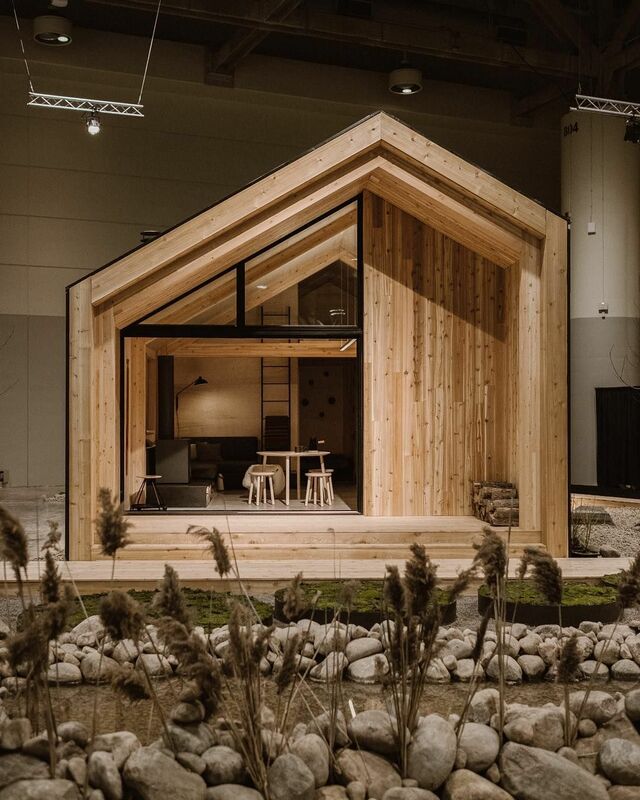 Even more exciting, the house on display at IDS was constructed in just 72 hours. As the promotions explained, the concept cabin “presents a modernist interpretation of the notion of rustic wilderness living based on the spirit of Canadian outdoor culture.” You could almost call it a pop-up cabin, except for the fact that it is durable and long-lasting, unlike other structures with a more fleeting existence. Customization can make the interior any size or style. The Backcountry Hut Company was created to design, plan and build of small-scale outdoor structures. 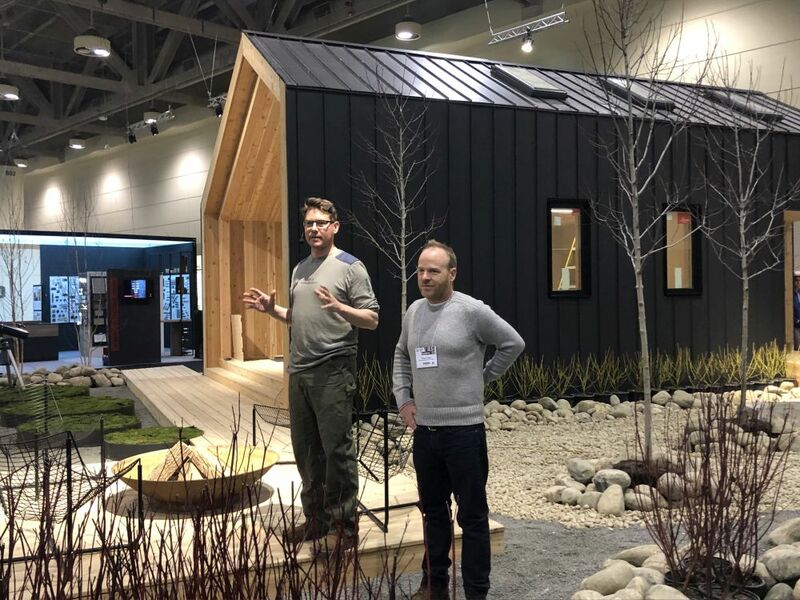 The company set out to demonstrate that custom architecture doesn’t have to be wildly expensive, co-founder Michael Leckie told the Toronto Star. 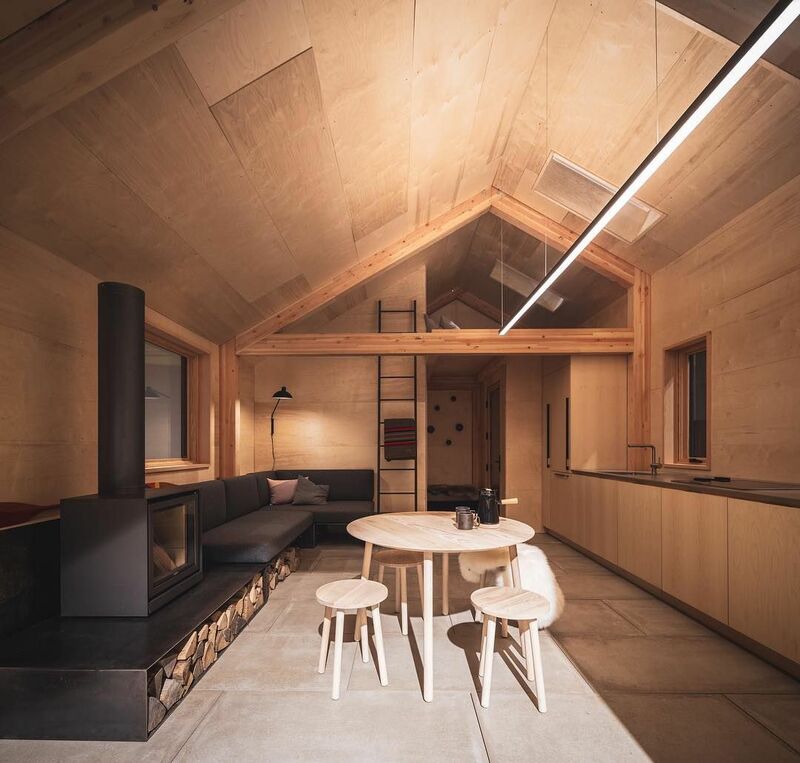 This Great Lakes Cabin was designed by Leckie Studio and is the latest addition to the company’s offerings. 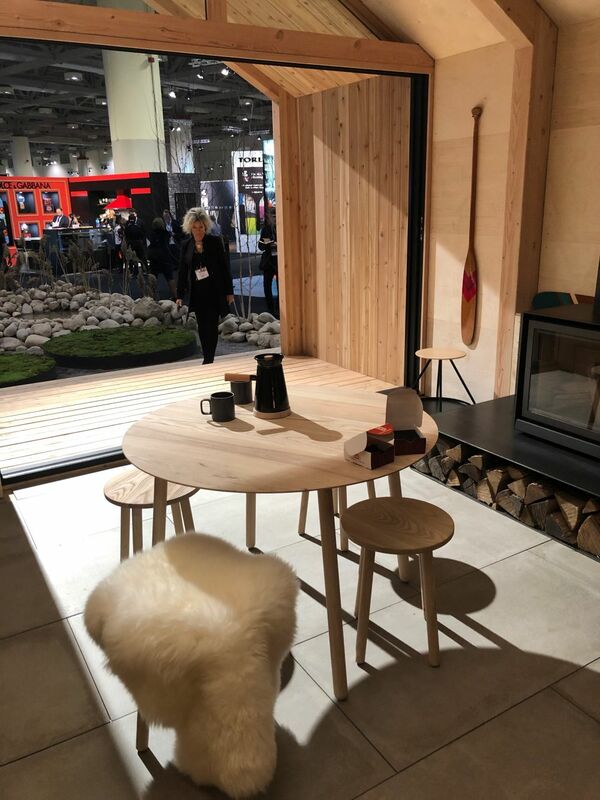 The cabin is durable and premium quality, allowing it to stand up to the harshest weather conditions that are found in Canada’s more remote areas. That said, it is also ideal for what the company calls “front country” locations that are less remote. Customized to include a fireplace, wood storage, and a full galley kitchen, the overall feeling is cozy and comfortable, never cramped. As a side benefit, all that wood has a wonderful smell that permeates the space and makes it feel extra natural! The cabin’s 670 square feet feel surprisingly roomy. What is simply an opening in this model home would actually be a spectacular window for enjoying the views of wherever the cabin is sited. Of course, because the design is customizable, windows can be moved and glass doors added as desired. 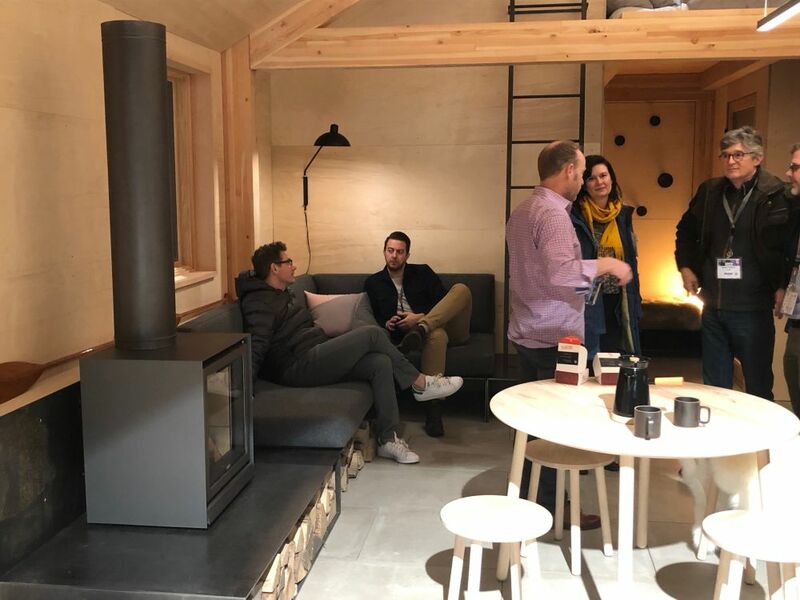 Backcountry Hut Company founders explained the customizable flat-pack concept to media. The cabins– of which there are currently three different models — are all made from Douglas fir and recycled metal exterior panels. The base model is just 206 square feet with a studio loft that sleeps two to four people and has an exterior covered entrance. The smallest one starts at $150 per square foot. From that base, everything is customized, including the final size. The Great Lakes Cabin, along with the Alpine Hut and Surf Hut, are made in Courtenay, British Columbia. Visitors to the house could experience the comfort and coziness of the space. 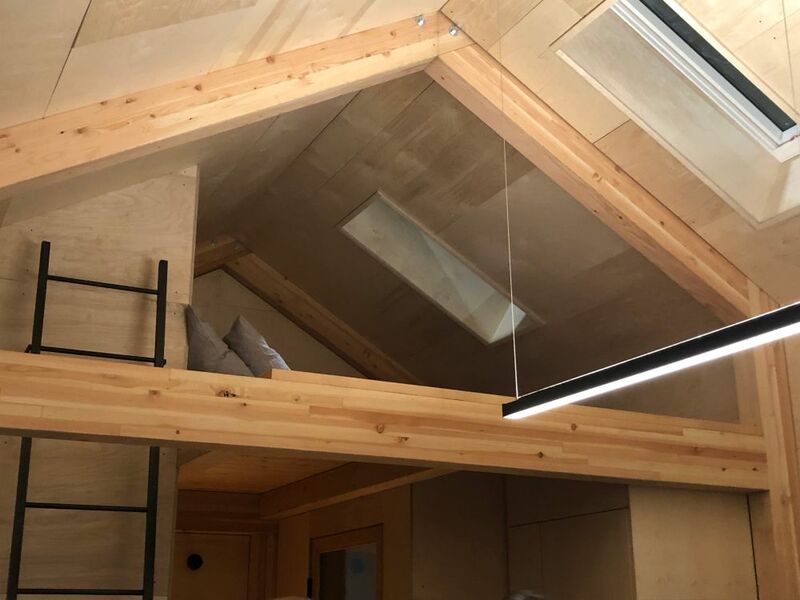 A sleeping loft is tucked away in the peak of the roof. The efficient little structure is design to have a minimal environmental impact no matter where it is sited. It encompasses 670 well-designed square feet that make use of every square inch and features a lofted sleeping area, a bathroom with a shower, and a covered exterior deck. 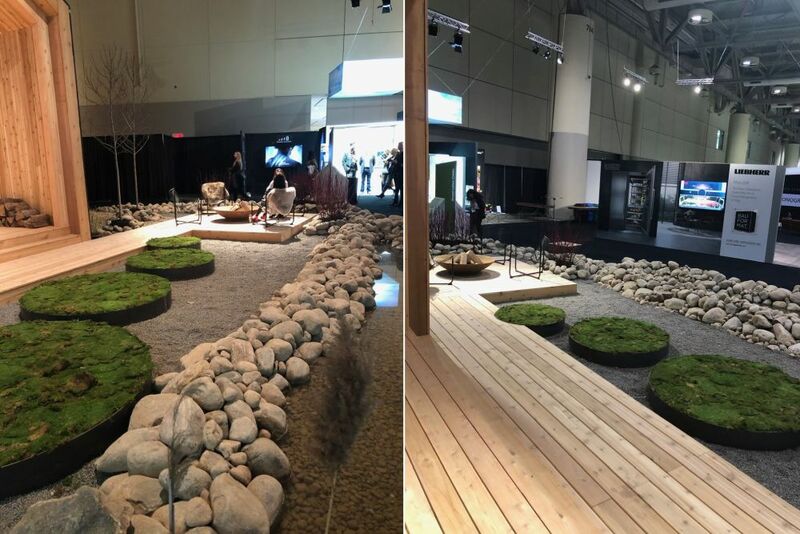 The installation at IDS included a landscape design installation by Flattery Design. An ample bathroom and convenient seating area are at the back of the cabin. 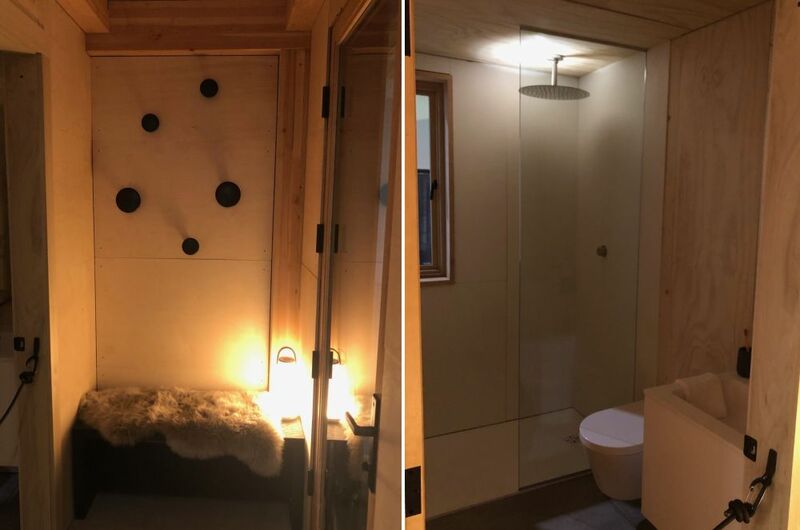 The small structure has a surprisingly roomy bathroom, with a real shower, toilet and washbasin — everything you need for a weekend getaway. Outside the bath, there is also a small area for hanging clothes or towels changing clothes. It’s also next to the back door, which means it’s an ideal spot for sitting down to remove dirty or snow-covered boots and outdoor clothing. The galley kitchen has all the basic conveniences. 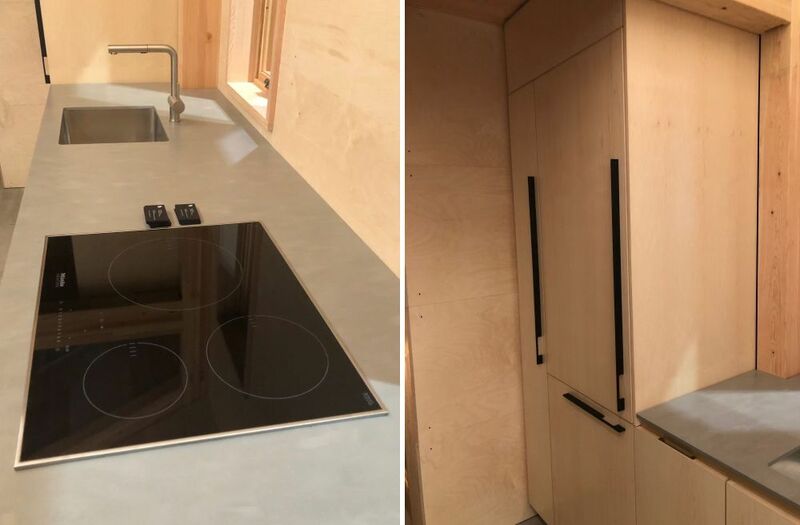 A well-equipped galley kitchen has all the basics, from a sink and induction cooktop to a coffee maker and a surprising amount of countertop workspace. Open shelving and closed cabinetry provide a good deal of storage. Walking around the cabin, it is striking how remarkably spacious it actually feels. A cooktop and a good deal of storage are built in. The main living space is prime for views out the front window. The main structural system is built with sustainably harvested engineered timber for the frame. The entire house is fitted with prefabricated insulated panels on the walls, roof and floor. Moreover, the whole system can be customized to meet Net Zero and Passive House standards. For the ultimate in sustainability, all the parts of the cabin are recyclable. 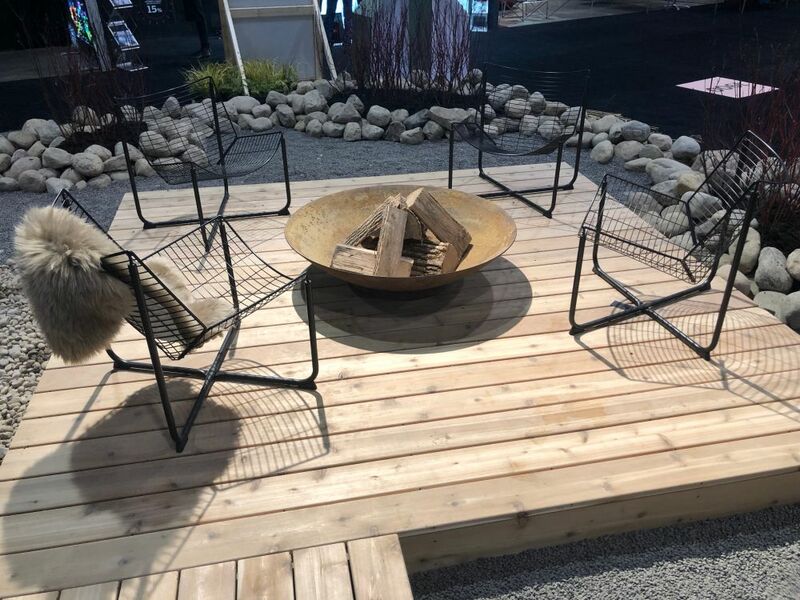 A firepit on a raised platform is great, but in a rustic setting a campfire would be equally appealing. Outside, the landscape design includes some wood decking for a dry spot where a firepit and seating can be installed. 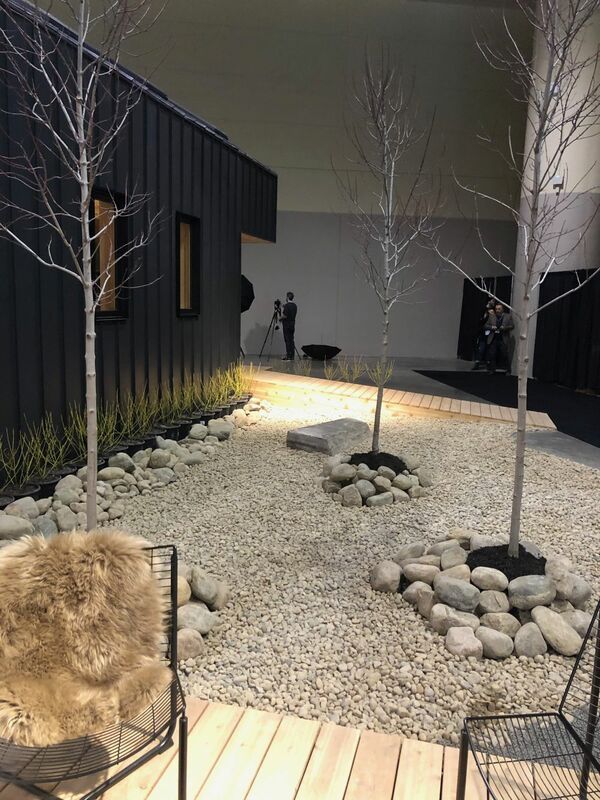 Despite the fact that the house was installed in a convention center, the landscaping around the building gives it a really rustic feeling. Cabins in less remote locations can include some landscaping. 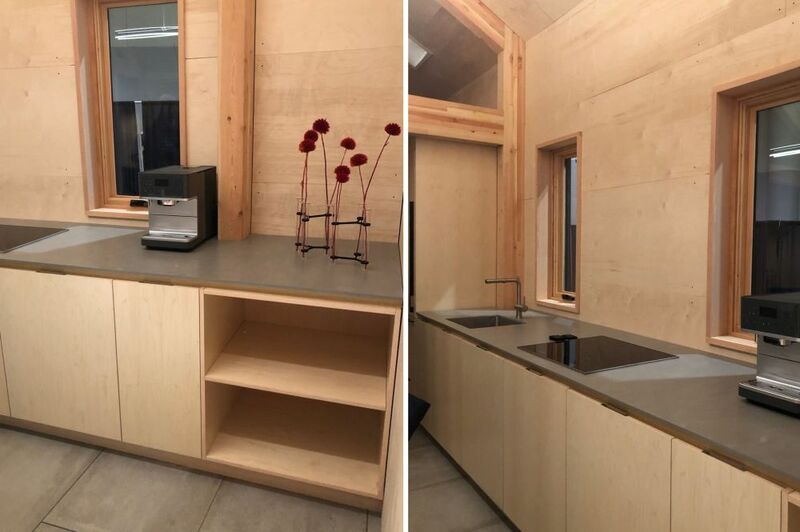 The cabins are constructed to have a minimal environmental impact. This view provides a good look at the windows and the metal cladding that covers the exterior of the building. In the back, the doorway is inset into the corner so that part of the upper sleeping loft acts as a cover, shielding it from rain or snow. The post Customized Pre-Fab Cabins are So Cozy You’ll Want to Go into The Woods appeared first on Home Decorating Trends – Homedit.